This team of girls was started in 2008 in the Under-12 age group and have grown together over the past seven years. In their inaugural year the girls were HNNS Junior Tournament Champions, and also finished the HDMJCL League Cup as runners-up. In 2009 they finished second-place in the HDMJCL U13 Girls Division. As U17's two years ago, they defeated the Hamilton Croatia Women's A-Team in Chicago to capture the HNNS Women's Division Tournament title. Last year they encountered a brand new challenge by entering the WWISL Women's Fourth Division. After a successful first season, the girls have accepted promotion all the way into the First Division, joining the other Hamilton Croatia Women's Team. At the present time this team does not have any sponsors. 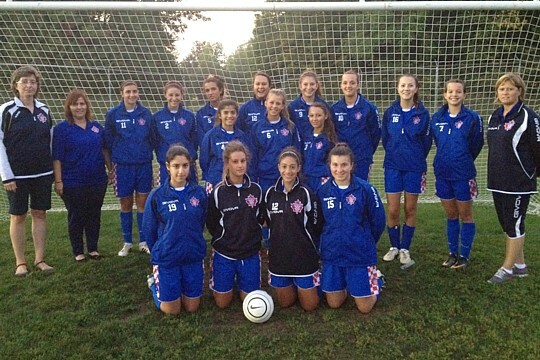 If you would like to support this team please contact sponsors@hamiltoncroatia.com.